‘This Is America’ is the first rap track to take home the song of the year at the 61st annual Grammy Awards. The track, penned by Donald Glover (aka Childish Gambino) and co-writer Ludwig Goransson, saw Gambino become one of the night’s biggest winners. 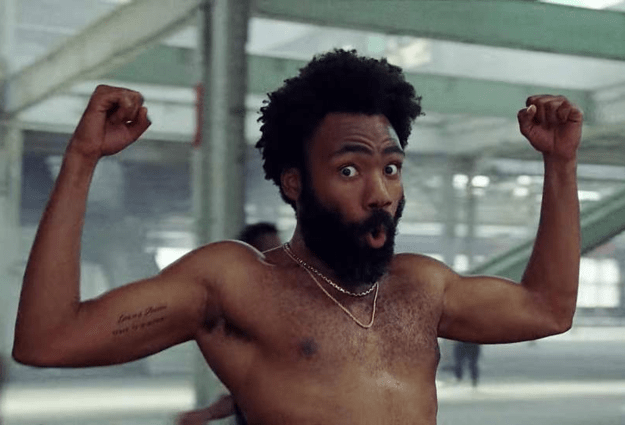 The socio-political track saw Gambino take home a total of four awards: both Song and Record of the Year, Best Music Video (with director Hiro Murai) and Best Rap or Sung Performance. Despite a night of big wins Glover wasn’t in attendance to accept his trophies. Major props have to be given to host Alicia Keys for filling in the unbearably awkward period where no one came on stage to accept Glover’s landmark award – yikes, watch that below. ‘This Is America’ premiered on Saturday Night Live back in March of 2018, and became a viral hit with over 482 million YouTube views to date. The provocative track touches on racism, police brutality, and gun violence in America – making it one of the most overtly political tracks to win the award. Glover’s history-making win comes after The Recording Academy aimed to diversify for the 2019 ceremony, following complaints that the Grammys failed to recognise talents from the rap and hip-hop genres in major nomination categories. Read our full round-up of the 2019 Grammy’s here.